This interesting surname of Scottish origin is a locational name from a place on the south bank of the Clyde outside Glasgow, called Erskyn. The etymology is not clear, it may be from the Celtic elements cognate with to the Welsh "ir" meaning "green" plus "esgyn", "to ascend". 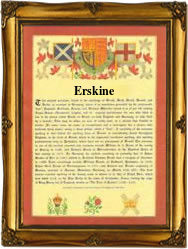 The surname dates back to the early 13th Century, (see below). Variations in the idiom of the spelling include Erskin (1225), Yrskin (1227), Ireskin (1262), Harskin, Irschen (1300). Church recordings include one Robert, son of David and Margaret Erskine who was christened on September 9th 1697 at St. Dunstan, Stepney. One John Erskine, aged 30 yrs a famine emigrant, sailed from Liverpool aboard the Spartan bound for New York on June 22nd 1847. The first recorded spelling of the family name is shown to be that of Henry de Erskyn, witnesses a charter, which was dated 1225, Abbey of Paisley, during the reign of King Alexander 11 of Scotland, 1214 - 1249. Surnames became necessary when governments introduced personal taxation. In England this was known as Poll Tax. Throughout the centuries, surnames in every country have continued to "develop" often leading to astonishing variants of the original spelling.